But then there is a clear threat to our wellbeing that is very much “in here” – part, unfortunately, of our very own world. While the percentage of American smokers has been dropping, there are still more than 30 million users of tobacco in the U.S. today, and all too many of them, regrettably, are in the Torah-observant Jewish community. There was a time when smoking was regarded as a harmless pastime – even, amazingly to us today, a healthy one. (“More doctors smoke Camels than any other cigarette!” boasted one 1940s ad.) Even in less distant times, the inhalation of tobacco smoke has been seen as repulsive but not suicidal. These days, though, no one denies that smoking is a major factor in contracting terrible ailments, including heart disease and lung cancer. According to the Centers for Disease Control (CDC), more deaths are caused each year by tobacco use than by illegal drug and alcohol abuse, vehicular injuries, suicides and murders. In the U.S., the mortality rate for smokers is three times that of people who never smoked. In fact, the CDC says that smoking is the most common “preventable cause of death” in the country. “Smoking,” the agency notes, “harms nearly every organ of the body” and contributes not only to heart disease and a host of cancers but to strokes and reproductive problems. And yet, seemingly oblivious Yidden can be seen outside shuls every erev Shabbos trying to ingest enough tar and nicotine (and, in fact, formaldehyde, lead and arsenic) to get them through the next 25 hours. And rushing out after Maariv on Motzoei Shabbos to resume their close relationships with the proven poison. Their habit harms not only themselves but their families. Even leaving aside the specter of wage earners’ early deaths, second-hand smoke is a danger in itself. And, even in the short term and even for those who don’t smoke at home, a half-pack-a-day habit can strain the family budget to the tune of a couple thousand dollars a year. But illustrious figures of the past didn’t know the extent of the harm tobacco can wreak, and Rav Moshe’s permission was based on the principle of “shomer pesayim Hashem” – that “Hashem protects fools” (Tehillim 116:6). Fooldom is not a club to which most self-respecting people aspire; and, in any event, there is a point where foolhardiness devolves into willful blindness to established fact. Rav Moshe’s other words, moreover, are widely ignored. In the same teshuvah he exhorted Jews to not begin smoking due to the “chashash sakanah,” the “possibility of danger.” It is no longer a mere possibility. And then there’s the other danger our smoking poses to our children, beyond second-hand smoke, from the example being set for them. Our community doesn’t just talk the talk of caring about our kids. We walk the walk. In fact, we run the run. We make sure that they are well-fed and clothed, that they receive strong Jewish educations, that they are mechunachim in mitzvos, and imbued with love for Torah and a Torah life. And we know that the most important part of chinuch is the example we set for our young. None of us, I hope, would think of acting in a dangerous, repulsive or irresponsible manner in front of our children. Smoking is dangerous, repulsive and irresponsible. There is good news, though. 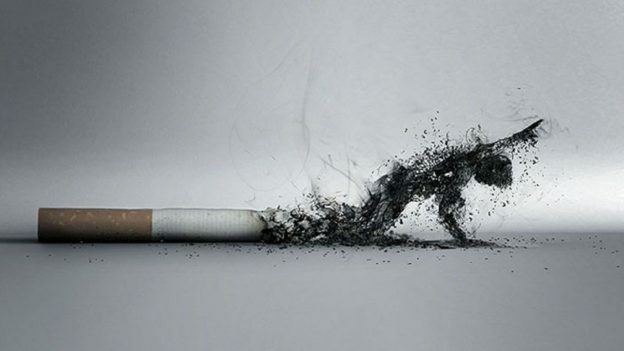 Although smoking’s damage to a body can last for years, most of the effects of the habit are not immediate, and many of them can be reversed if a smoker quits. I see an opportunity here for some enterprising tzorchei-tzibbur-minded individual: a Torah-based Smokers Anonymous, a group of frum smokers who want to quit but who may need the support of others like themselves to succeed in doing so. But first, of course, there have to be smokers who want to quit. Please come forth, and soon. This entry was posted in Jewish Thought on July 27, 2018 by Rabbi Avi Shafran.